The electrical equipment east of the road here handles the output of the hydro-electric power station, the white building behind the former Porth Llwyd Hotel. The station was built in the early 1920s to provide electricity for the aluminium factory which stood on the site now occupied by Surf Snowdonia. The photo on the right shows the original equipment. Dolgarrog’s history of using water for power goes back to water mills which exploited the rapid fall of water along the Porth Llwyd river to process wool, grind corn, saw timber and make paper. The river altered its course in 1925 when the Dolgarrog dam disaster swept a mass of debris down the river’s course, demolishing buildings along the way. Dolgarrog’s first hydro-electric power station opened in 1907. It fed a bauxite-reduction furnace, in the same building. 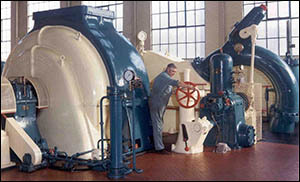 The water supply for cheap hydro-electricity was the reason Dolgarrog was chosen for power-intensive aluminium production. New legislation in 1919 established the Electricity Commissioners, who advised local authorities on how to electrify their areas. The first public electrification in Britain to result from the commissioners’ work used a power line from Dolgarrog power station to Colwyn Bay, Conwy and Llandudno. It went live in 1922 and was later extended to Wrexham and Hawarden (near Chester). 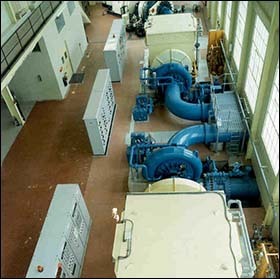 The water supply system was expanded for the new power station. When the Aluminium Corporation built new houses for its workforce (the rows of semi-detached homes you can see south of the village) in the 1920s, it gave them free domestic electricity. The result: houses where the lights were rarely turned off! The corporation soon began charging per unit of electricity, but not before the village had earned the local nickname “Piccadilly Circus”. The original power station closed in 1966. The 1920s station, now owned by RWE Innogy, feeds the National Grid was upgraded in 1992 and again, at a cost of £15m, in 2014. The photo on the left shows the interior and 1992 equipment. The leats and pipelines which bring the water from the uplands are now configured as two independent feeds into the power station from Llyn Cowlyd and Llyn Coedty, generating 17MW and 15MW of electricity respectively. After being used to generate electricity, some water from the power station’s outflow tops up the nearby Surf Snowdonia lagoon.